Every 30 seconds, over a million dollars is spent globally on online sales. Most of this money is spent on leading ecommerce sites including Amazon, Ebay, Alibaba and others, who thrive solely on web-based transactions. Ecommerce sales continue to grow steadily into the billions each year, and with big-time companies gathering an increasing number of transactions, it’s no surprise that another company has joined the ecommerce rat race. As we all know, Amazon is the frontrunner of the United States ecommerce market. By undercutting prices, buying out competitors and claiming the lowest prices on the web, the site has maintained its spot on top for nearly two decades. In 2014 alone Amazon brought in net sales of over 88.99 billion dollars, and had more than 270 million active customer accounts. While these numbers are mind-bogglingly huge, it is important to remember that Amazon does not make a profit from the majority of their online sales. The real money maker is the yearly memberships they offer, known as Amazon Prime. With an Amazon Prime account plus the 99 dollar membership fee, users get access to perks such as free two-day shipping, unlimited streaming of movies and videos and access to one free e-book per month from the Amazon library. Without an Amazon prime account, users get free shipping on orders over 25 dollars, but will have to wait the average 5-10 business days to receive the order. Is Prime Worth It for Users? In order to weigh whether Amazon Prime is worth the 99-dollar-per-year membership fee, users need to spend at least 99 dollars in shipping costs per year, and frequently order online. If not, a regular account on Amazon is free. But wait a minute — what if you could get a similar membership with a fee of only 50 dollars per year? What if the things you’d buy would be cheaper than Amazon’s prices? Sounds too good to be true — however, newly launched ecommerce site Jet.com offers just that. How do they do it, you ask? Well here is the method behind their madness. Similar to Costco or Sam’s Club, Jet.com sells merchandise at a club price, with a required membership fee of 49.99 dollars per year — half the price of Amazon Prime. Shoppers are able to get items cheaper than they would in a store, but unlike Amazon, the savings don’t stop here. Jet.com has a different approach than most ecommerce platforms, with a built-in function that drops prices as you shop. Listed below are the four features that make Jet.com a standout against other ecommerce sites. Jet saves their customers money with a feature known as “smart items,” which are products that have dropped in price based on previously added cart items — basically the more items added, the greater the savings. The website indicates discounted items with a blue dollar sign icon, along with the amount you will save by adding that item to your cart. Unlike Amazon, Jet sends purchased items in one shipment, saving the company money on shipping and handling costs, which in turn saves the customer extra money at checkout. When you receive your order, it will all be in one convenient box. Another thing that Jet takes into account is the customer’s billing zip code, helping to save them money by shipping items from the same location. This is a feature that Amazon does not implement, yet helps knock dollars off your cart total if the items you wish to purchase are distributed in the same area. One more new feature that Jet offers is the ability to forgo returning an item for an additional discount, which can save you a pretty good chunk of money depending on the value of the item in your cart. As a shopper, if you know you are going to keep the item you buy, this can be a beneficial money-saver. As you can see, the cheaper cart goes to Jet.com. Because I added multiple items to my cart and entered my zip code, the site was able to save me more money. I could have also chosen to save an additional amount by electing not to return the items, which if I had, would have decreased my cart total to $497.39 — over 50 dollars in savings compared to Amazon. 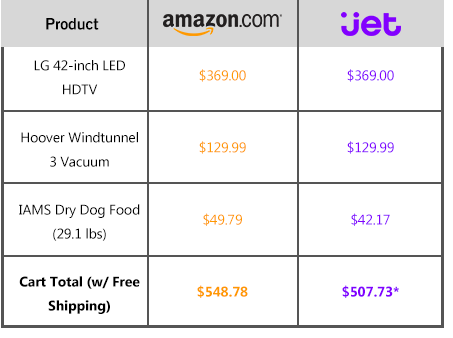 While the cart from Jet.com was cheaper, it’s worth noting that Amazon’s product inventory is much larger than Jet.com’s. Amazon offers over 200 million products compared to Jet’s supply of 10 million products. But, to be fair, Jet.com launched in July 2015 and will likely increase inventory with time. As a frequent online shopper, seeing how Jet is challenging Amazon is very exciting. Everyone likes to save money, and it seems that Jet.com has come up with legitimate tactics to shave dollars off of your online shopping bills. As for Amazon, maybe they will start to implement the same features as Jet and squash their competitors. Or maybe the e-tail giant will stick to its traditional ecommerce method and loyal customers won’t switch over. Regardless, with Jet.com’s innovative plans, Amazon finally has some serious competition in the ecommerce market. Interested in amping up your ecommerce platform? Check out this FREE report on the top 10 ecommerce software! Marketing Intern, Is Ecommerce Site Jet.com the New and Improved Amazon?